There are so many online sites to share our creativity and connect with others it becomes quite overwhelming...where do we draw the line? 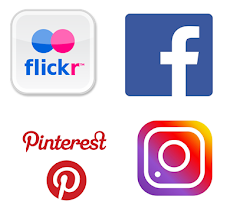 I'm listing my social media presence here so if you don't want to become a blog follower, there are some other options for you to see when I post. I began my blog in July of 2010! Although I've had a couple of breaks where I thought I wanted to stop, I love having a record of all my projects with the process photos which capture how I did things. I have quite a few followers now, so obviously it's also inspiring to others which is fantastic. About the same time I started the blog I realised I needed a Flickr account as well - back then it was a way to share art in classes. 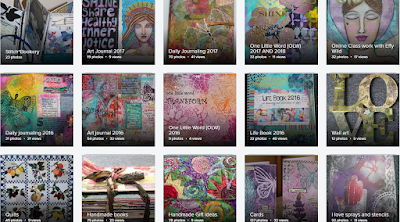 I still post to Flickr - it's a useful way of bringing together photos of my art in albums. I've had a personal FB account for a while and it was my practice to refuse FB friend requests from people I didn't know in person, and post art things publicly. However, last year I decided to create a FB artist page as an option for people to see my work without having to follow my blog. I also belong to a number of FB groups where I love the supportive artistic communities, but I comment there with my personal profile. Then there's Pinterest....I have a few boards mainly for seasonal fashion inspiration and a couple of inspirational boards for words of the year. I've just started including my art on Pinterest in 2018. I've begun with my art journaling for 2018 and will add more boards as the year progresses. But I hope this post encourages you to find me in a place/s of convenience to you. I was glad to read this post this morning and followed you on several platforms. While I hope to spend more time reading blogs in 2018, I do spend a lot of time on instagram and facebook. Mostly because of the ease of catching up in between things. (ie. in line on the grocery etc.) So it is nice to be able to have multiple ways of keeping in touch! I love to create, especially using a combination of fabric and paper with stitch, and often using sprays and stencils. I am married with 2 sons, and love living in Palmerston North, New Zealand. 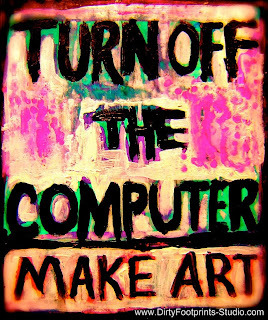 CLICK HERE for my list of cheap and FREE online artful classes I've seen available.